Since she first joined the cryptocurrency industry in 2015, Ms. Demirors has been actively managing and leading investment firms; supporting and advising founders building early stage companies; and leveraging her experience and network to accelerate the growth of the crypto asset class and the firms developing it. In her role at CoinShares, Ms. Demirors oversees strategy, and focuses on developing private funds and investment vehicles to provide institutional investors with thematic, risk-managed exposure to the emerging crypto asset ecosystem. In addition, she serves as the managing director of the firm’s US operations. 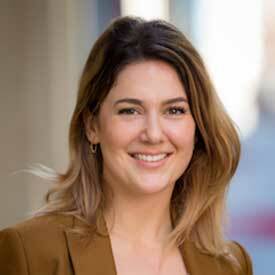 From 2015 until 2018, Ms. Demirors led the Development team at Digital Currency Group, where she oversaw the investment portfolio consisting of 120 companies and protocols across 30 countries, and managed business partners and investors, including family offices, financial institutions, and corporations, across the DCG portfolio of companies and subsidiaries. Previously, Ms. Demirors was a strategy consultant in Deloitte’s Oil & Gas practice, where she led international M&A projects in the energy industry and published research in the Oil & Gas Financial Journal and other industry publications. Ms. Demirors advocates for a number of industry initiatives focused on market infrastructure, data integrity, and portfolio management practices; most notably via her participation in the World Economic Forum Blockchain Council. She hosts a weekly podcast that explores the intersection of finance, history, and technology, called “What Grinds my Gears,” and the annual “Crypto Springs” conference in Palm Springs. Ms. Demirors holds a BA in Mathematical Economics from Rice University, and an MBA from the MIT Sloan School of Management. She works closely with the academic community on education and research efforts, and helped create the MIT “Future of Commerce” online course and the Oxford Saïd Business School Blockchain Strategy Program, where she still actively lectures. When she isn’t causing mischief on Twitter, she can be found reading science fiction novels. Ms. Demirors is an active writer, via her blog on Medium, and is passionate about financial privacy and civil liberties.